Original CD and Book provides unique Japanese American educational material for children. The CD includes bilingual songs such as Gosei Alphabet I and Gosei Numbers. The book is written in Romaji and Hiragana with English translations. 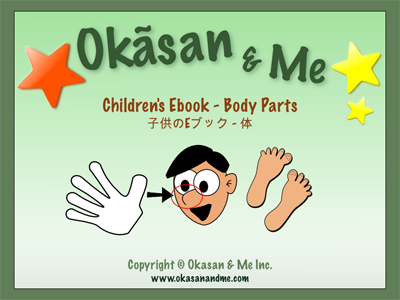 Children can learn the Japanese alphabet in just one hour by song and dance. Order Form To purchase these educational products please click this link to download order form. New Educational Interactive DVD -- to be announced soon. 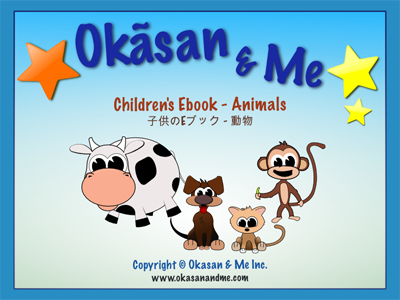 Preview Japanese Animal Sound - Part of the Okasan and Me Interactive DVD! The educational interactive dvd contains original songs and original arrangements in bilingual format. Lessons for the learning the Japanese hiragana, numbers, colors, simple sentence structure. Songs such as Funny Wani (alligator) Brushes His Teeth, I Love Tofu, Gosei Alphabet provide a fun and exciting adventure for children and their parents. A montage of Japanese American history is presented through the charcoaled drawings of Rose Iso an internee during WWII in the Topaz concentration camp. Homer Takahashi and the men of the Japanese American 442 Regiment Battalion, the highest decorated soldiers in US history are featured together with an original song Ojiichan 442. Okasan and Me Inc. creating a "new generation" where "chicken teriyaki" is not the only association that we have with our Japanese heritage. 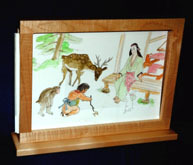 The Kamishibai frames are created by Henry Nakata, of Aspen Ten Shoji, Inc., a master craftsman of Japanese shoji screens and woodwork.